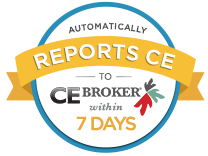 CE Broker precisely spells out each licensee’s requirements and tracks your progress as you complete continuing education hours. When CE Broker reflects you’ve met your continuing education requirements, you will not receive an audit letter from the Ohio Board of Speech-Language Pathology and Audiology (Board). Compliance in CE Broker means you’ve already completed the electronic continuing education audit. You can rely on CE Broker for your continuing education requirements and calculating progress towards those requirements. Subscribing and viewing your Transcript gives you access to the same data used by the Board. Professional Development Resources is proud to announce that we now report to CE Broker for Ohio-licensed SLPs and audiologists! We have been reporting to CE Broker for Florida licensees for over 10 years now and so it was an easy choice to include Ohio licensees in the process. We report all courses licensees complete through us once per week (on Thursday) so you won’t have to wait for ASHA to submit, or worry about reporting yourself. Professional Development Resources is approved by the Continuing Education Board of the American Speech-Language-Hearing Association (ASHA Provider #AAUM) to provide continuing education activities in speech-language pathology and audiology. See course page for number of ASHA CEUs, instructional level and content area. ASHA CE provider approval does not imply endorsement of course content, specific products or clincial procedures. CEUs are awarded by the ASHA CE Registry upon receipt of the CEU Participant Form from the ASHA Approved CE Provider. Please note that the completion date that appears on ASHA transcripts is the last day of the quarter, regardless of when the course was completed. Professional Development Resources is also approved by the Florida Board of Speech-Language Pathology and Audiology (Provider #50-1635) and is CE Broker compliant (all courses are reported within 1 week of completion). Click here for Board FAQs on CE Broker.